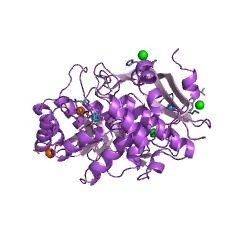 Mandelate racemase (MR) and muconate lactonizing enzyme (MLE) are two bacterial enzymes involved in aromatic acid catabolism. They catalyze mechanistically distinct reactions yet they are related at the level of their primary, quaternary (homooctamer) and tertiary structures (PUBMED:2215699), (PUBMED:8256284). 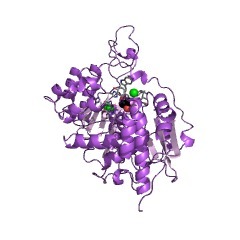 This entry represents the C-terminal region of these proteins. 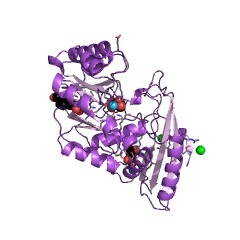 Mandelate racemase EC 5.1.2.2 (MR) and muconate lactonising enzyme EC 5.5.1.1 (MLE) are two bacterial enzymes involved in aromatic acid catabolism. They catalyse mechanistically distinct reactions yet they are related at the level of their primary, quaternary (homooctamer) and tertiary structures [(PUBMED:2215699), (PUBMED:8256284)]. 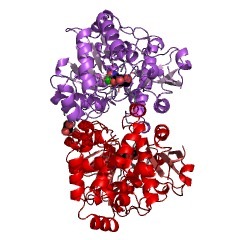 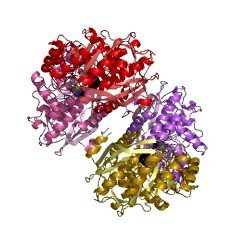 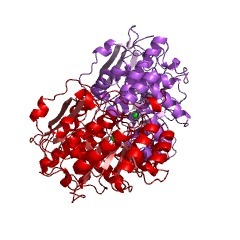 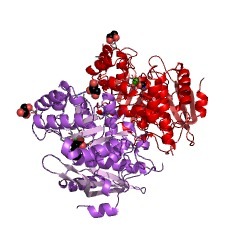 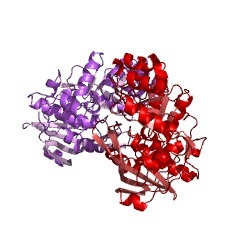 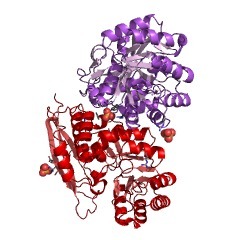 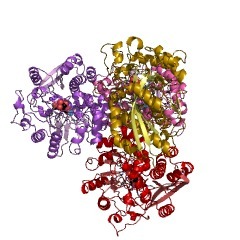 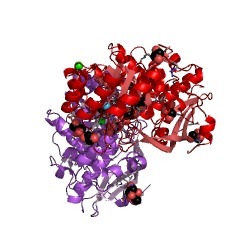 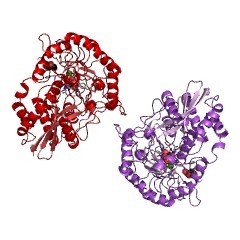 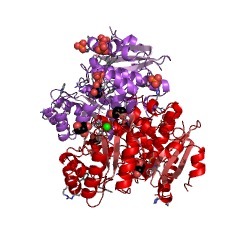 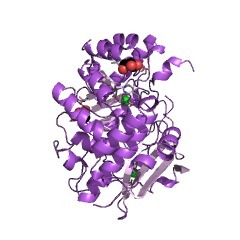 A number of other proteins also seem to be evolutionary related to these two enzymes. 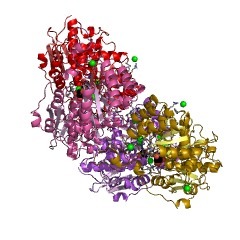 These include, various plasmid-encoded chloromuconate cycloisomerases EC 5.5.1.7, Escherichia coli protein rspA [(PUBMED:7545940)], E. coli bifunctional DGOA protein, a number of D-galactonate dehydratases and D-mannonate dehydratases, and a hypothetical protein from Streptomyces ambofaciens [(PUBMED:8277241)]. 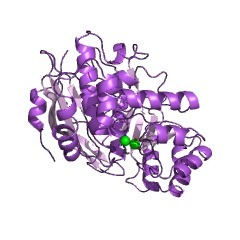 This entry represents the C-terminal region of these proteins. 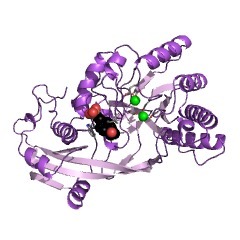 There are 58843 MR_MLE domains in 58841 proteins in SMART's nrdb database. 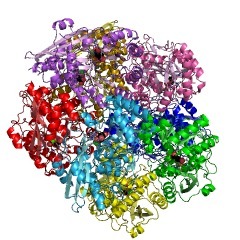 Taxonomic distribution of proteins containing MR_MLE domain. This tree includes only several representative species. The complete taxonomic breakdown of all proteins with MR_MLE domain is also avaliable. 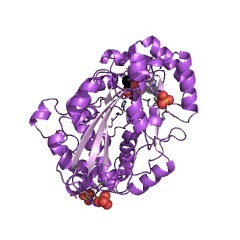 Click on the protein counts, or double click on taxonomic names to display all proteins containing MR_MLE domain in the selected taxonomic class. 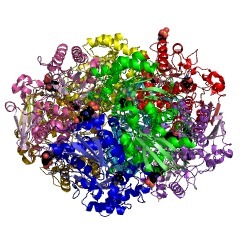 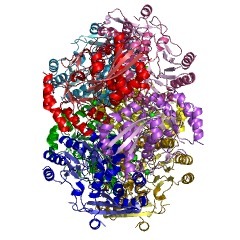 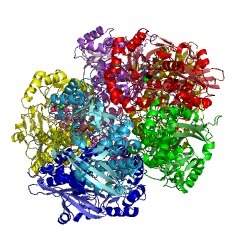 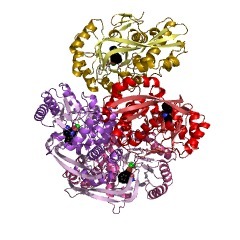 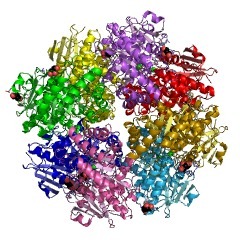 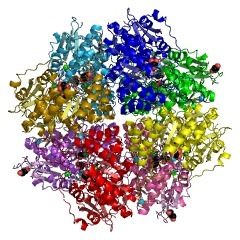 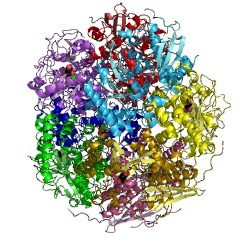 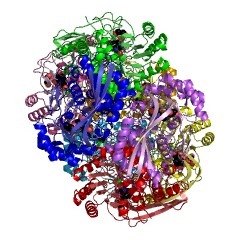 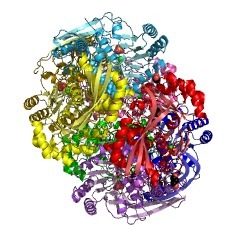 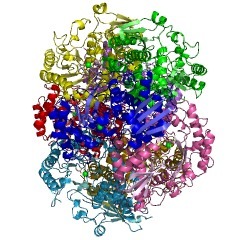 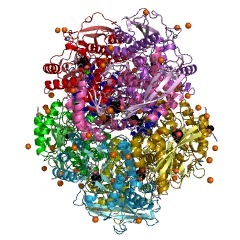 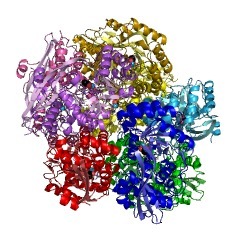 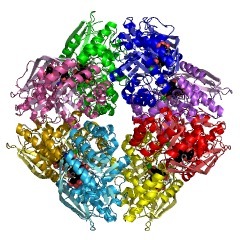 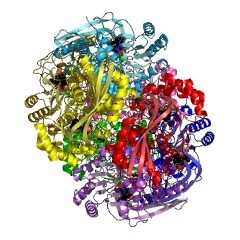 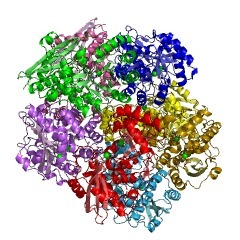 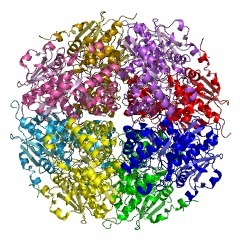 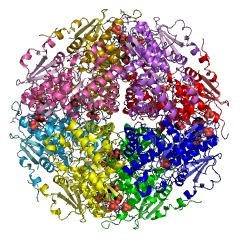 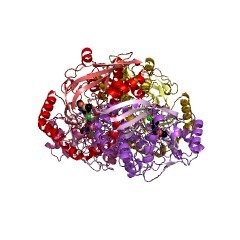 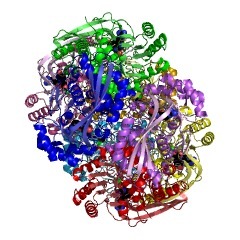 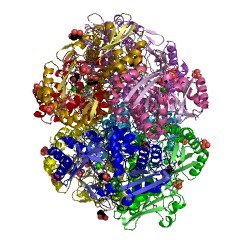 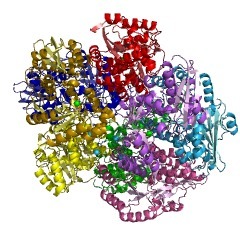 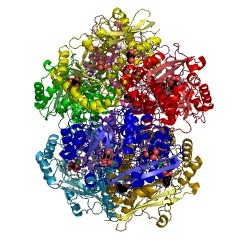 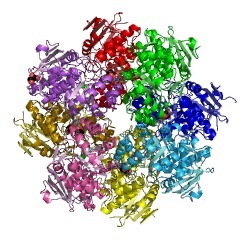 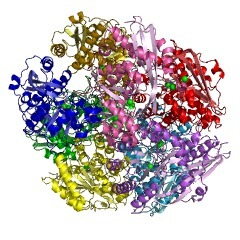 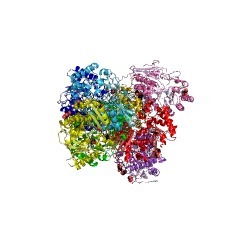 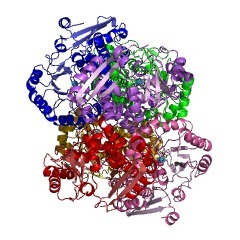 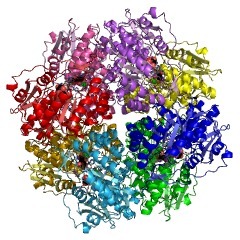 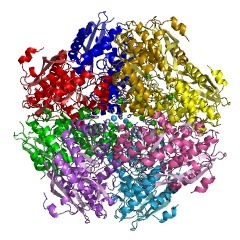 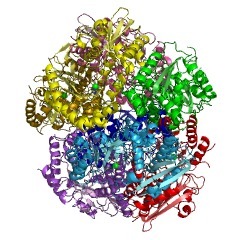 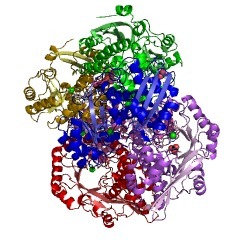 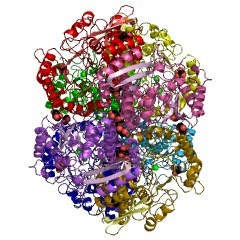 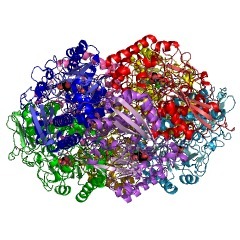 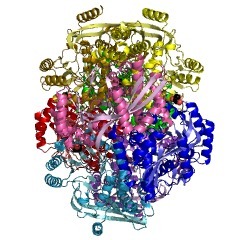 The diversity of enzyme catalytic function is remarkable, particularlywhen one considers that ancestral life forms must have started with a muchsmaller ensemble of proteins. 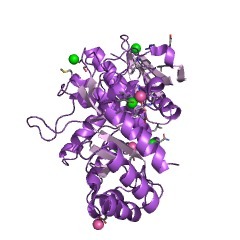 In this article, we discuss the evolution ofthe mandelate pathway in pseudomonads as an example of how catalyticdiversity may have evolved. 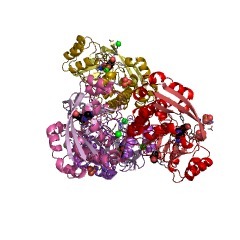 We suggest that existing enzymes that catalysethe chemistry needed to accomplish a transformation were recruited,followed by the evolution of specific binding. 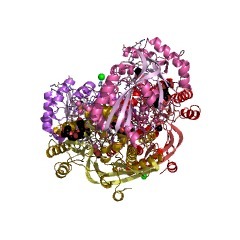 Mandelate racemase and muconate lactonizing enzyme are mechanisticallydistinct and structurally homologous. 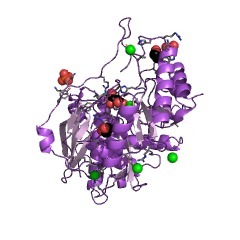 Mandelate racemase (MR) and muconate lactonizing enzyme (MLE) catalyseseparate and mechanistically distinct reactions necessary for thecatabolism of aromatic acids by Pseudomonas putida. 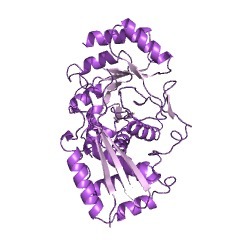 The X-ray crystalstructure of MR, solved at 2.5 A resolution, reveals that the secondary,tertiary and quaternary structures of MR and MLE are remarkably similar;also, MR and MLE are about 26% identical in primary structure. 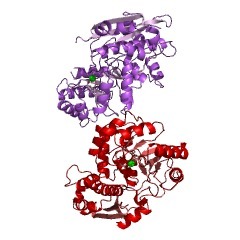 However, MRhas no detectable MLE activity and vice versa. Thus, MR and MLE constitutethe first example of enzymes that catalyse different reactions, as opposedto mechanistically identical reactions on different substrates, yetpossess sufficient structural and sequence identity that they are likelyto have evolved from a common ancestor. 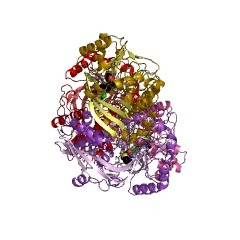 The discovery that MR and MLEcatalyse different reactions but share a common structural framework hasbroad implications for the natural evolution of enzymes and metabolicpathways, as well as for the rational modification of enzyme activities. 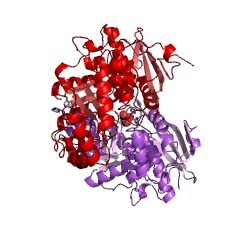 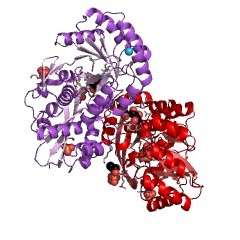 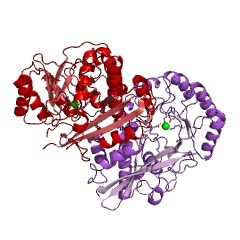 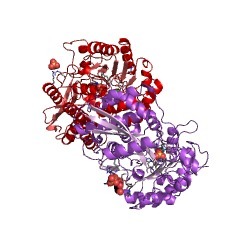 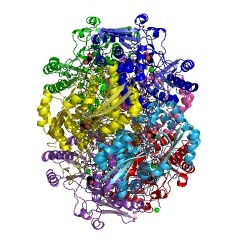 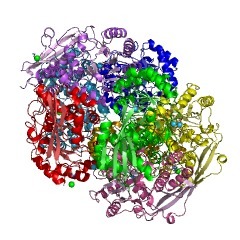 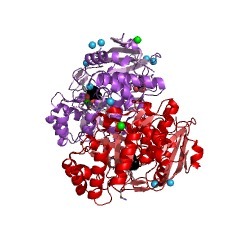 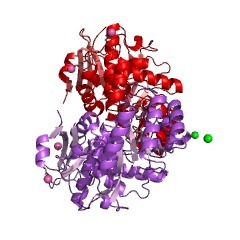 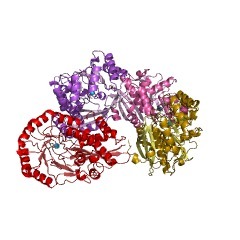 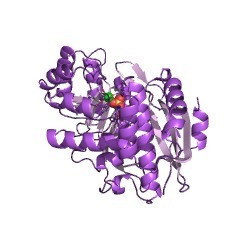 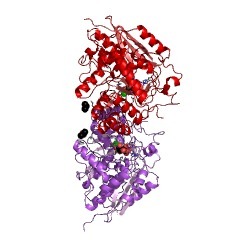 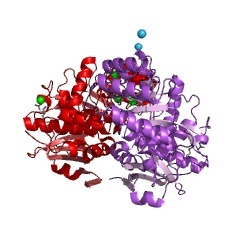 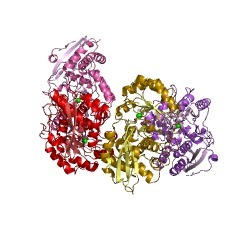 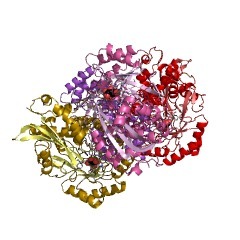 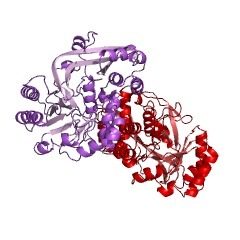 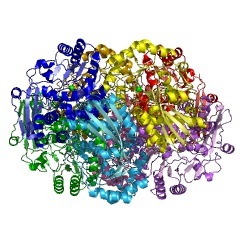 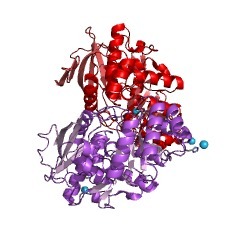 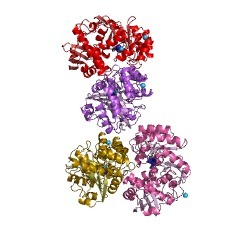 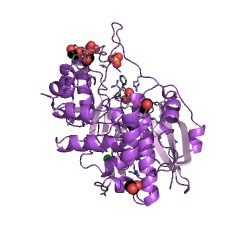 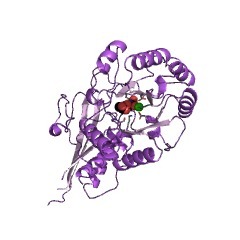 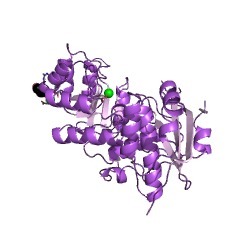 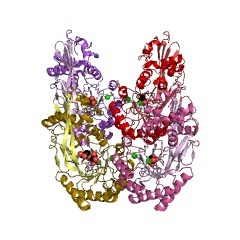 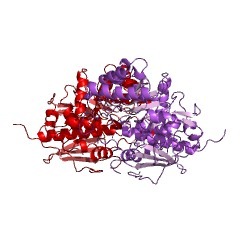 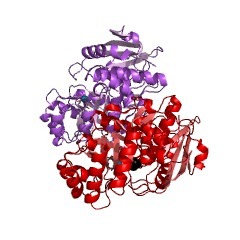 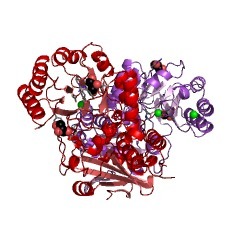 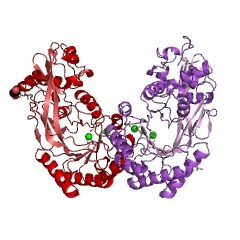 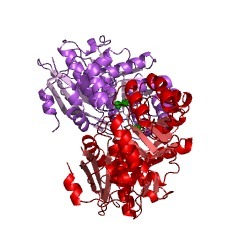 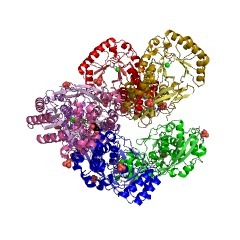 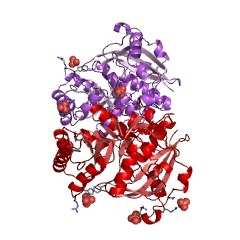 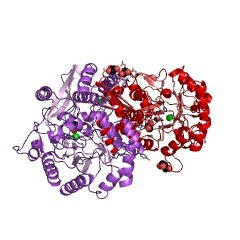 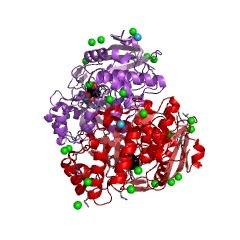 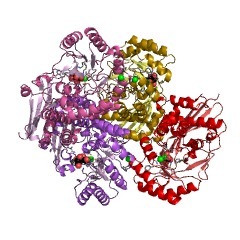 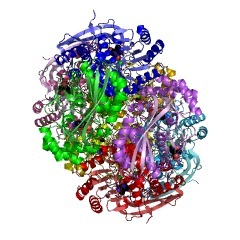 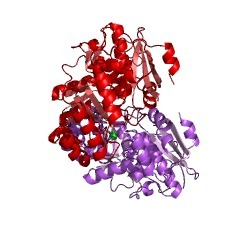 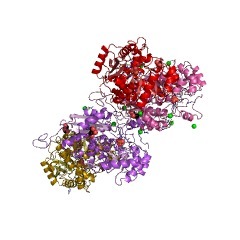 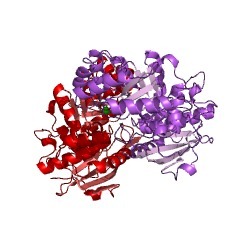 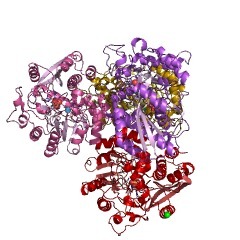 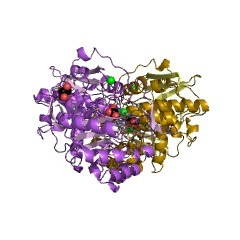 The crystal structure of muconate lactonizing enzyme has been solved at 3A resolution, and an unambiguous alpha-carbon backbone chain trace made.The enzyme contains three domains; the central domain is aparallel-stranded alpha-beta barrel, which has previously been reported insix other enzymes, including triose phosphate isomerase and pyruvatekinase. 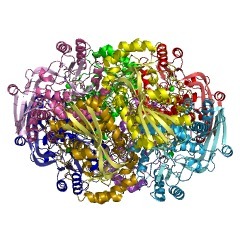 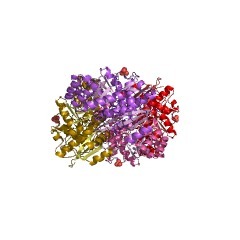 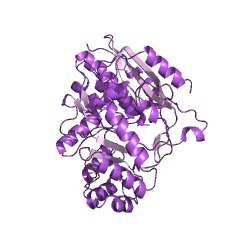 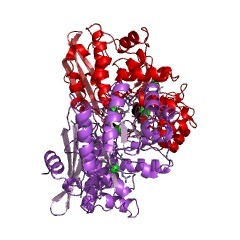 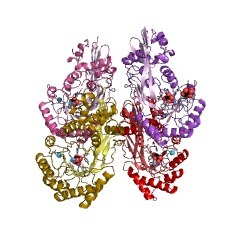 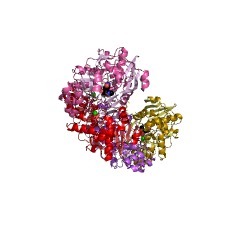 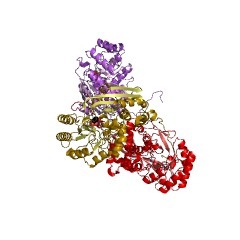 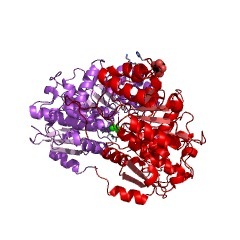 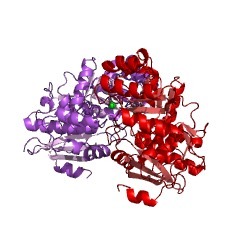 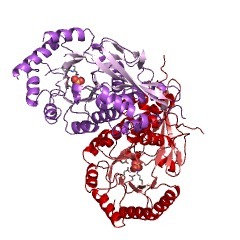 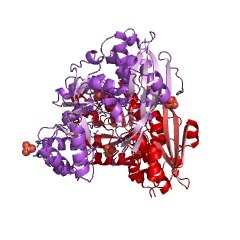 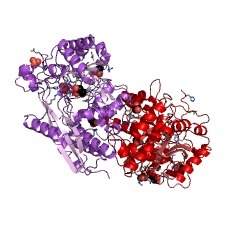 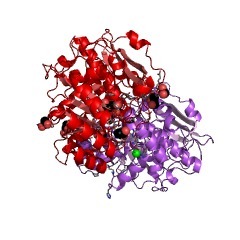 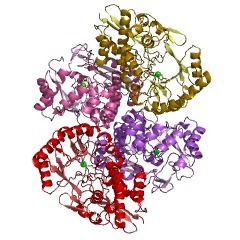 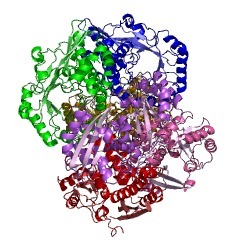 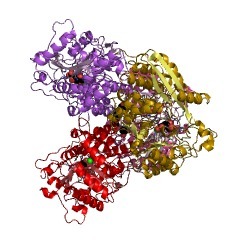 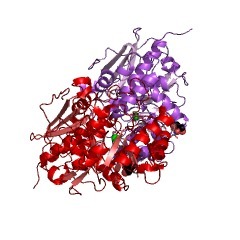 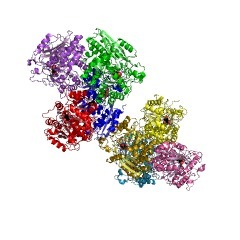 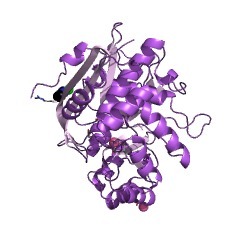 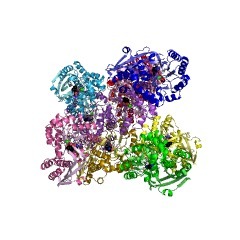 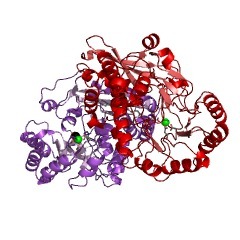 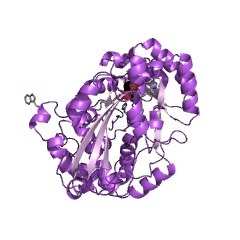 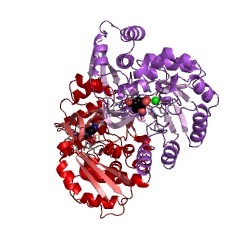 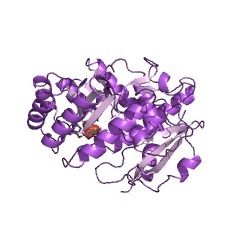 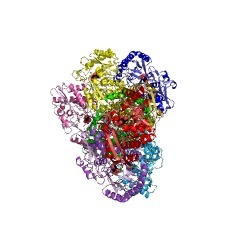 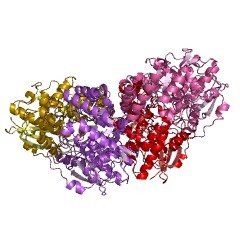 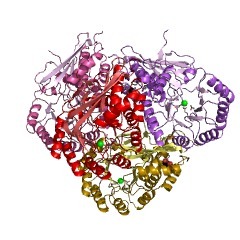 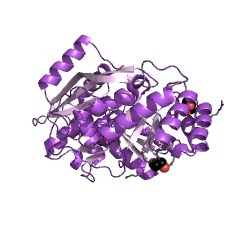 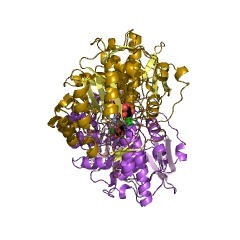 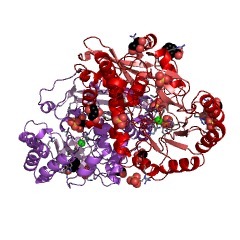 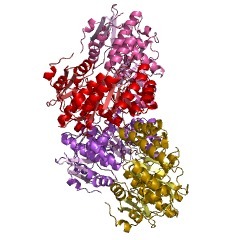 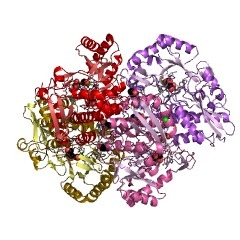 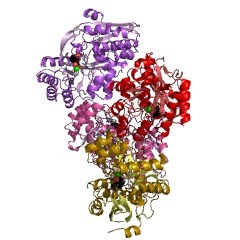 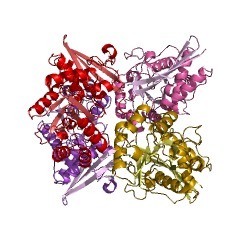 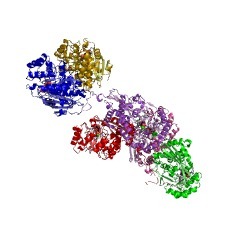 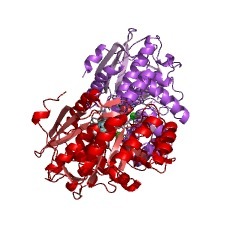 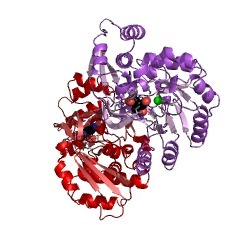 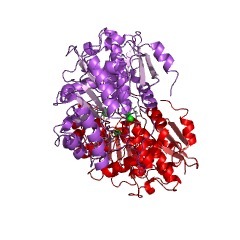 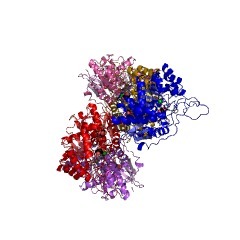 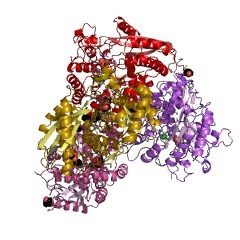 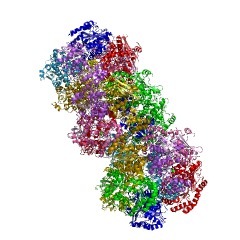 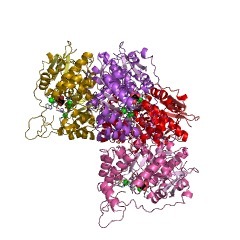 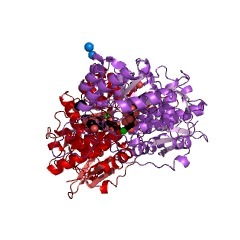 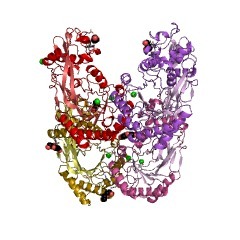 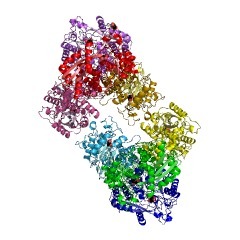 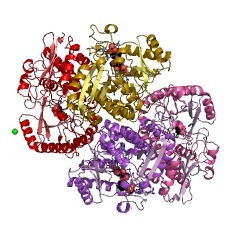 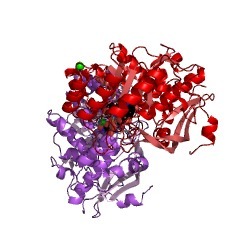 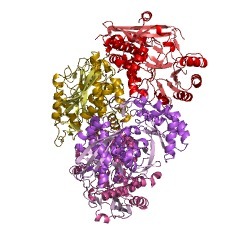 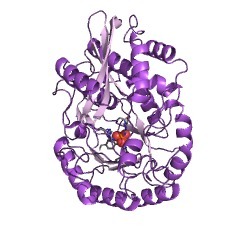 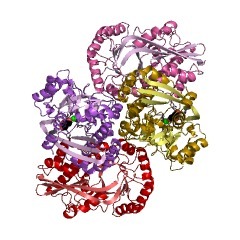 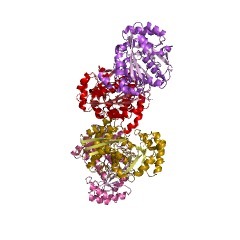 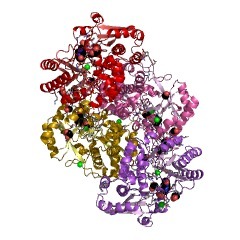 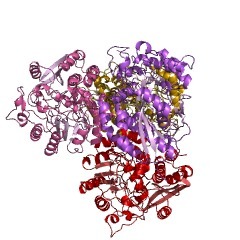 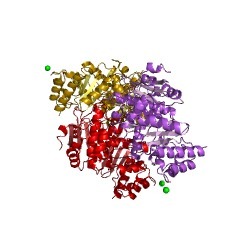 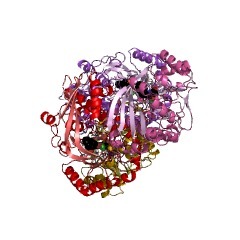 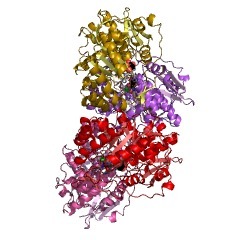 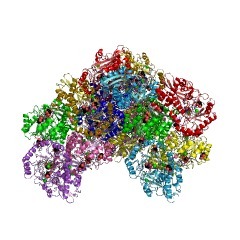 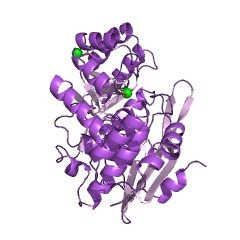 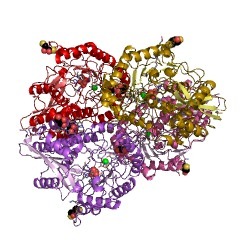 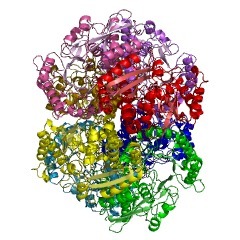 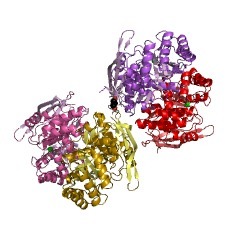 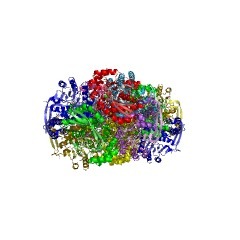 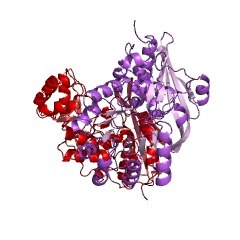 One novel feature of this enzyme is that its alpha-beta barrel hasonly seven parallel alpha-helices around the central core of eightparallel beta-strands; all other known alpha-beta barrels contain eightsuch helices. 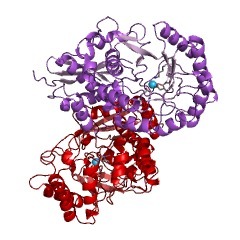 The N-terminal (alpha + beta) and C-terminal domains coverthe cleft where the eighth helix would be. 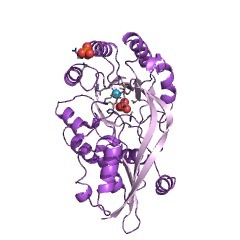 The active site of muconatelactonizing enzyme has been found by locating the manganese ion that isessential for catalytic activity, and by binding and locating aninhibitor, alpha-ketoglutarate. 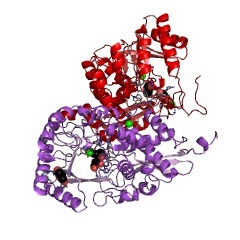 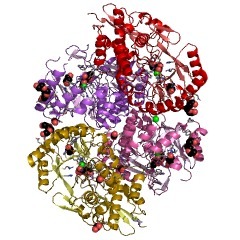 The active site lies in a cleft betweenthe N-terminal and barrel domains; when the active sites of muconatelactonizing enzyme and triose phosphate isomerase are superimposed,barrel-strand 1 of triose phosphate isomerase is aligned withbarrel-strand 3 of muconate lactonizing enzyme. 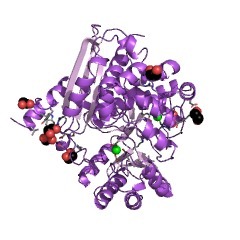 This implies thatstructurally homologous active-site residues in the two enzymes arecarried on different parts of the primary sequence; the ancestral genewould had to have been transposed during its evolution to the modernproteins, which seems unlikely. 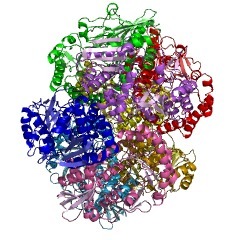 Therefore, these two enzymes may berelated by convergent, rather than divergent, evolution. 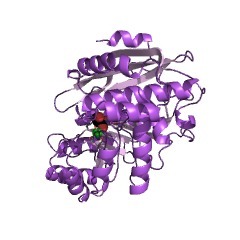 2p8b Crystal structure of N-succinyl Arg/Lys racemase from Bacillus cereus ATCC 14579 complexed with N-succinyl Lys. 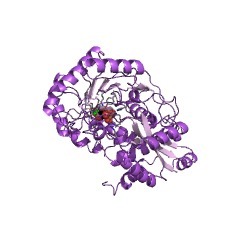 2p8c Crystal structure of N-succinyl Arg/Lys racemase from Bacillus cereus ATCC 14579 complexed with N-succinyl Arg. 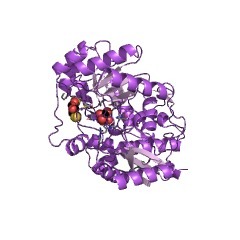 3es7 Crystal structure of divergent enolase from Oceanobacillus Iheyensis complexed with Mg and L-malate. 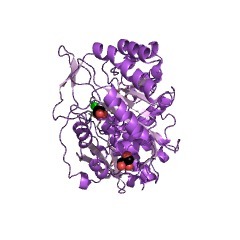 3es8 Crystal structure of divergent enolase from Oceanobacillus Iheyensis complexed with Mg and L-malate. 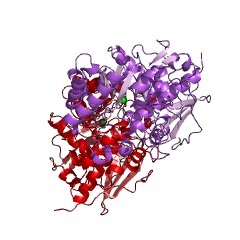 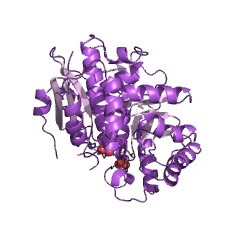 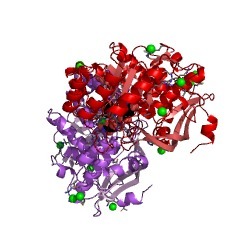 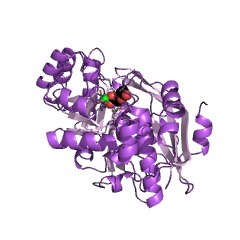 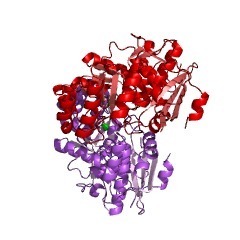 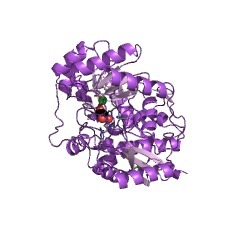 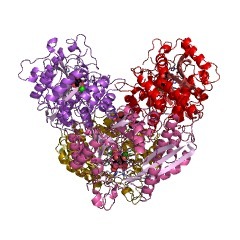 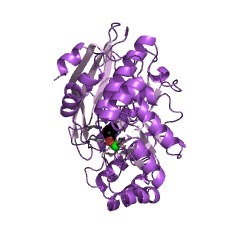 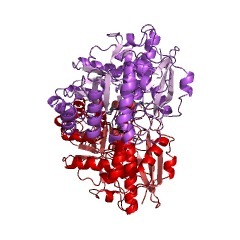 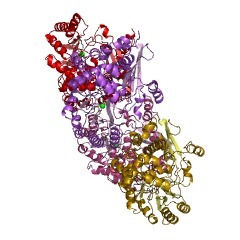 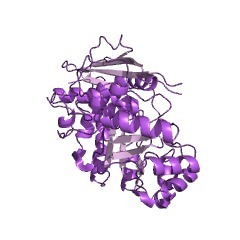 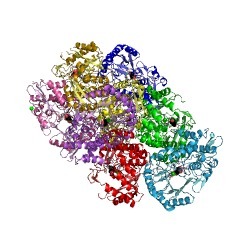 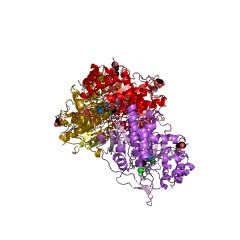 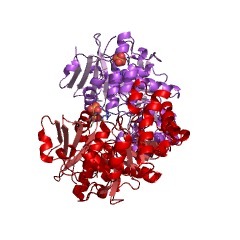 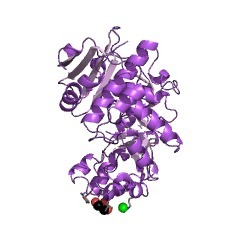 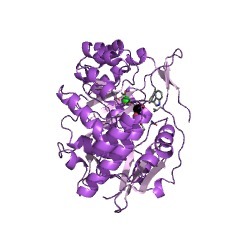 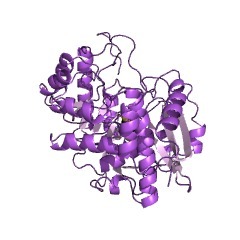 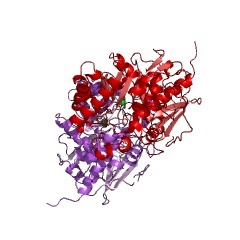 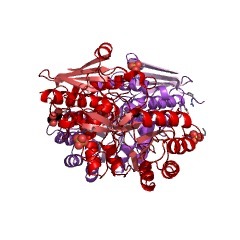 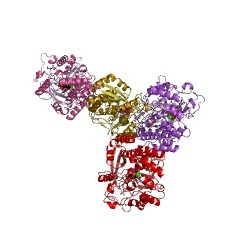 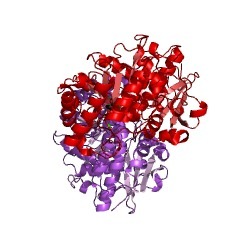 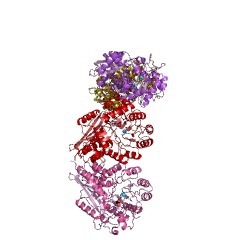 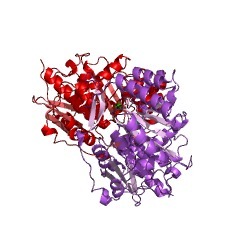 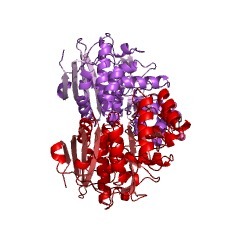 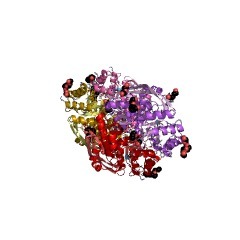 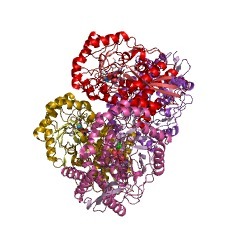 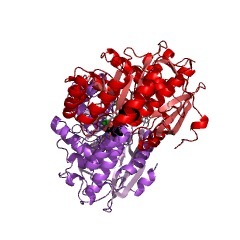 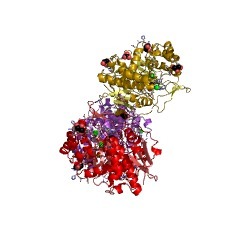 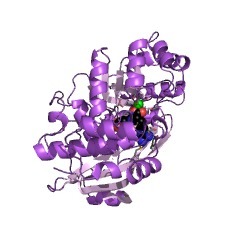 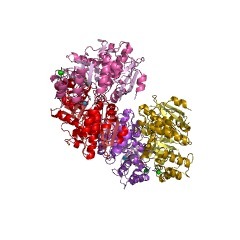 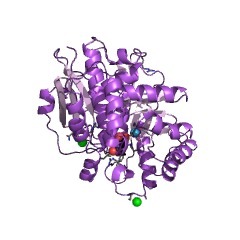 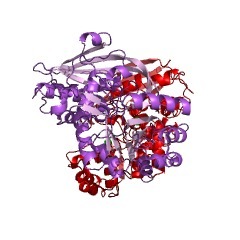 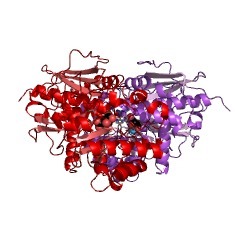 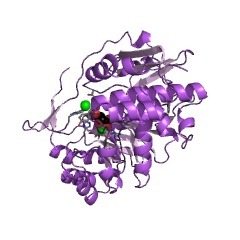 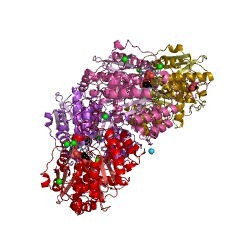 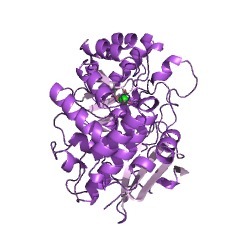 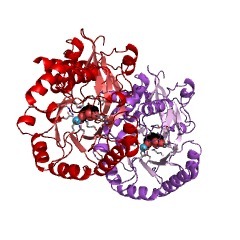 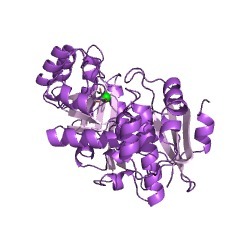 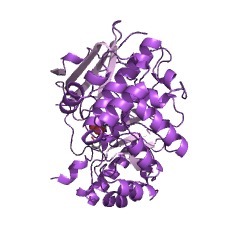 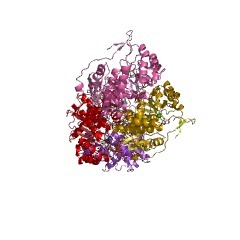 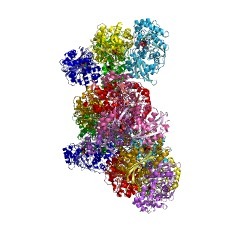 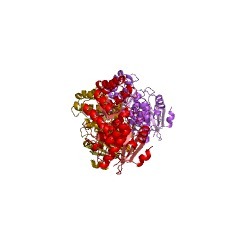 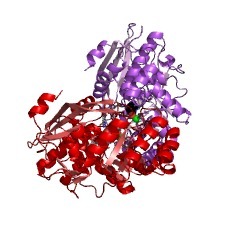 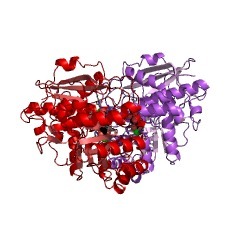 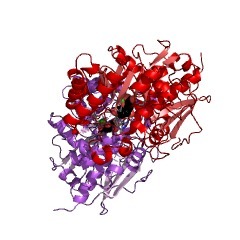 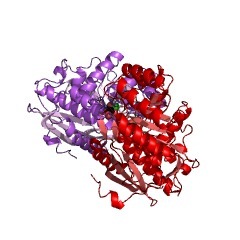 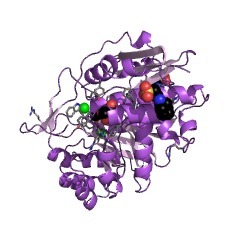 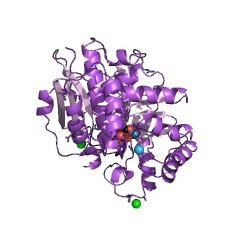 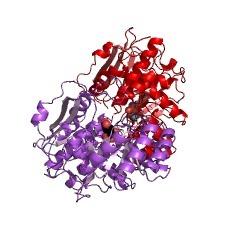 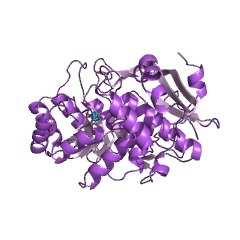 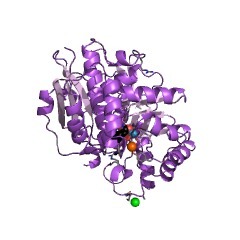 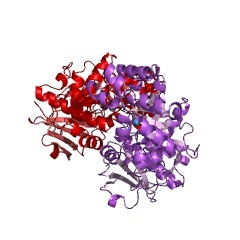 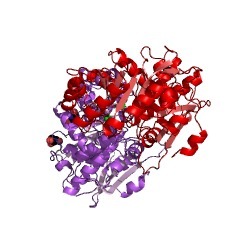 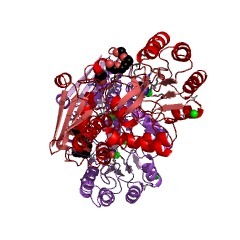 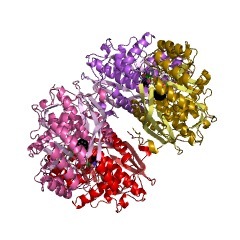 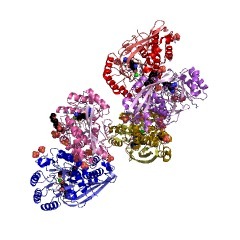 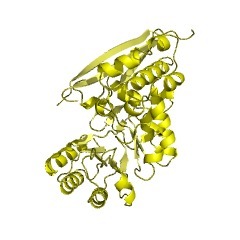 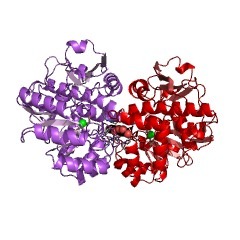 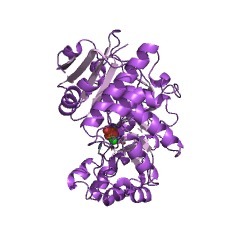 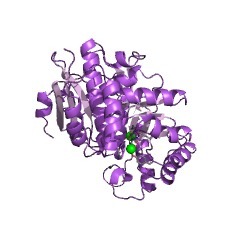 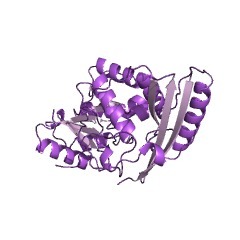 3i6e CRYSTAL STRUCTURE OF MUCONATE LACTONIZING ENZYME FROM Ruegeria pomeroyi. 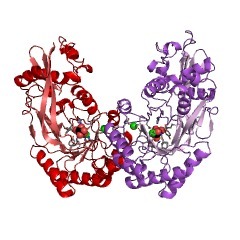 3i6t Crystal structure of muconate cycloisomerase from Jannaschia sp. 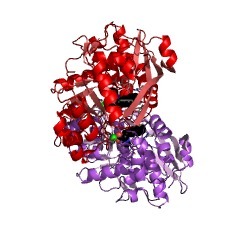 3iji Structure of dipeptide epimerase from Bacteroides thetaiotaomicron complexed with L-Ala-D-Glu; nonproductive substrate binding. 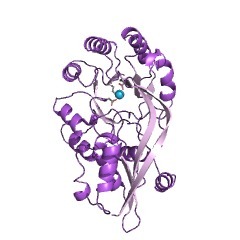 3ijl Structure of dipeptide epimerase from Bacteroides thetaiotaomicron complexed with L-Pro-D-Glu; nonproductive substrate binding. 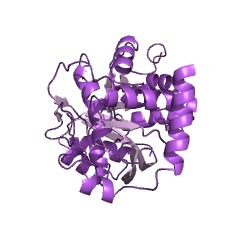 3ijq Structure of dipeptide epimerase from Bacteroides thetaiotaomicron complexed with L-Ala-D-Glu; productive substrate binding. 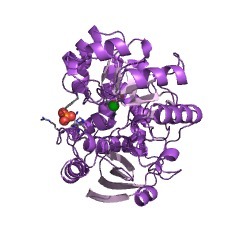 3u9i The crystal structure of Mandelate racemase/muconate lactonizing enzyme from Roseiflexus sp.